LOS ANGELES -- Honda Motor Co. has been spotted testing a CR-V mule that looked like it’s flirting with a third row of seats for the next-generation model. But don’t bet on that coming to the U.S. 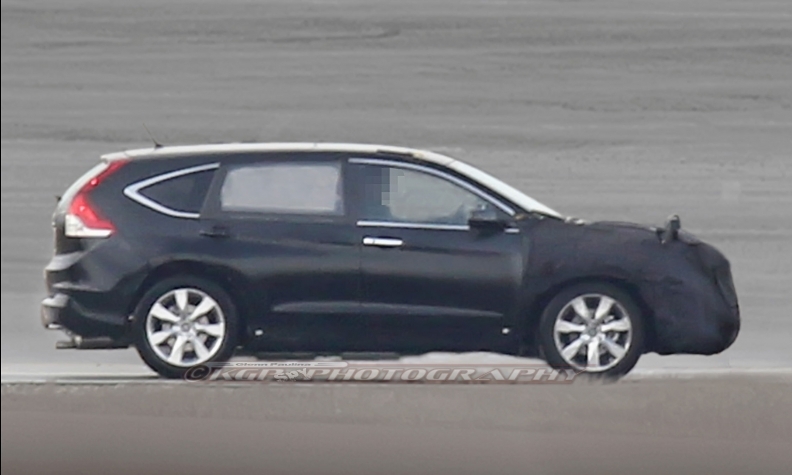 The single photo shows a prototype model shot from the side, with the distinctive CR-V taillights running up the rear of the car. The front is entirely covered, with a pair of bolt-on headlights sticking up from the hood. But the most interesting bit is the rear door. Or, more specifically, its length. Blacked-out with camouflage tape, the door is conspicuously longer than on the current production CR-V. Could the next-gen CR-V, due in 2017, be available with a third row of seats? Sources say yes, but not in the U.S.
Abroad, the CR-V competes against other compact crossovers with three rows, which are steadily becoming popular replacements for MPVs, those weird little minivans. Plus, adding a third row to the CR-V puts more space between it and the new HR-V globally. But in the U.S., where the CR-V is the top-selling crossover, Honda has the Pilot and Odyssey to offer buyers looking for maximum people-moving capabilities. So expect this prototype to keep its residency elsewhere.